One of the white whales of vaccine research—a cure for addiction—is a very small step closer to reality. 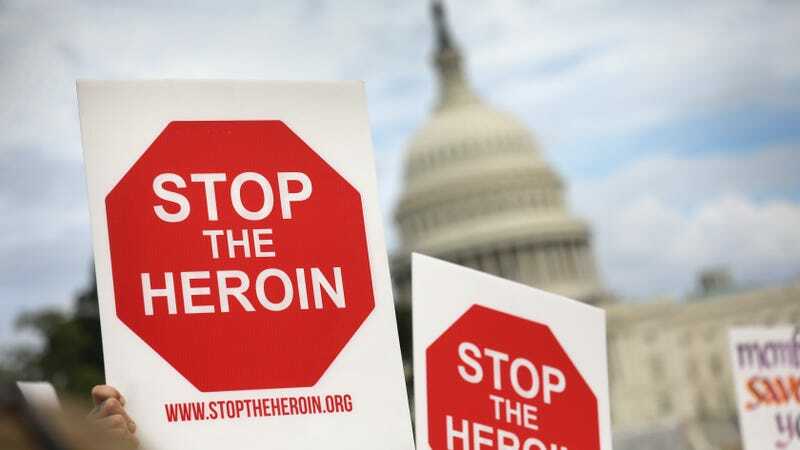 Last week, researchers working at the Walter Reed Army Center published a study showing that their experimental vaccine was able to block the euphoria-inducing effects of heroin and other commonly abused opioids in mice and rats. Almost as importantly, the vaccine didn’t dampen the effects of other related drugs like methadone, which are used (controversially) to wean people off opioid addiction. Taken as a whole, that opens up the possibility their vaccine could someday become part of a toolkit for opioid addiction recovery. “Although we are still in the early phase, this study suggests that vaccination can be used together with standard therapies to prevent the withdrawal and craving symptoms associated with opioid withdrawal,” study author Gary R. Matyas, Chief of Adjuvants and Formulations at the U.S. Military HIV Research Program, said in a statement. Encouraging as the findings are, it’s important to know that we’ve been on this merry-go-round before. Since the 1970s, scientists have tried to create vaccines capable of priming the body to make antibodies that would target and stop drug molecules from crossing the blood-brain barrier and triggering a high. And while there have been some promising candidates that made it to as far as human clinical trials, all have come up short. This approach is fundamentally different from existing medications to treat opioid dependence, such as pellet implants that are loaded with the drug naltrexone and inserted under the skin. Naltrexone is an opioid antagonist, which means it enters the brain and occupies (but doesn’t activate) the receptors that would otherwise be triggered by an opioid. The implants, which are only available in Europe currently, send a constant dose of naltrexone coursing the body, and last for about two to six months. A vaccine, on the other hand, would allow the body to recognize and destroy the molecules of a drug like heroin before they reach the brain. In addition to being more specific, since drugs like naltrexone interfere with our body’s ability to process all opioids, even those we produce naturally as painkillers, a vaccine might also come with fewer side effects. In previous trials of promising vaccines, their drug-blocking effects only lasted for several months, but it would still just take a single shot for the immunity to set in, as opposed to a constant treatment course. The challenge is to create a specific and powerful enough immune response. Because the molecules that make up heroin and other drugs aren’t recognized as threats by the immune system, scientists have tried to give heroin a giant ‘KICK ME’ sign, by stapling it to a type of protein that prompts an immune response. They also add chemicals called adjuvants that further goad the immune system into action. The team’s vaccine, for example, loads heroin onto the protein we use to immunize people from the bacterial disease tetanus. Even getting this process right is only half the battle, though. Unlike your typical flu shot, a drug abuse vaccine would have to fight against human will even after it’s taken. A highly motivated person could simply overwhelm the immune system by ingesting more of the drug, since the body can only produce so many antibodies at a time. There isn’t an easy solution to this problem. “We hope to give people a window so they can overcome their addiction,” Matyas said. His team even aims to someday couple their vaccine to one that can prevent HIV, since people who abuse drugs are at higher risk of contracting the virus. How this will all shake out in the real world is still anyone’s guess. There’s at least one other heroin vaccine candidate that’s further along in the process, having been tested successfully in other primates. Elsewhere, Cornell researchers are in the midst of recruiting volunteers to take part in a trial of an anti-cocaine vaccine.